"Almanzo, do you know what this is?" And boy did they know what hard work was. I think Janie and I are both hard workers (we learned how to hustle hard from our parents) but just reading chapter after chapter of what life was like for those who grew up living off the land in the 1800s is exhausting. I think this has sunk in with our 7 and 6 year old as they've heard how this 9 year old boy works all day gathering the eggs, milking the cows, breaking in the calves, making candles, planting and harvesting the crops, tapping the trees, cutting ice blocks from the pond and hauling them to the barn to make a seasonal freezer. Emptying a couple trash cans and making their beds doesn't sound so bad after all of that. School was also a little bit different. 1. Today we have classrooms for each age. Back then they had one classroom for all ages. 2. Today we have security guards and metal detectors for our children's protection. Back then it was not uncommon for teachers to be physically assaulted (even killed) by disgruntled students. When Almanzo's teacher pulled out a blacksnake ox-whip from his desk and used it in defense on one such teenage hoodlum when he and his gang threatened to attack I half expected this teacher to be called before the school board while the outraged parents of the "misunderstood children" threatened legal action. After reading through a couple fantasy fiction books (Harry Potter and the Sorcerer's Stone and The Lion, the Witch and the Wardrobe), Janie thought it would be a good idea to introduce the boys to a story more grounded in grit and reality. She fondly remembers reading the "Little House" books during her childhood and selected Farmer Boy since it would be the one our sons would most relate to. This book was actually given to Janie by her mom when she turned 10. At first I didn't know if our boys would get into Farmer Boy. I couldn't have been more wrong. I am thrilled that our boys who have fully embraced the techie world of Minecraft, Star Wars and iPhone apps still thoroughly enjoyed being transported to a time in history we could all learn a lot from. One last tip. 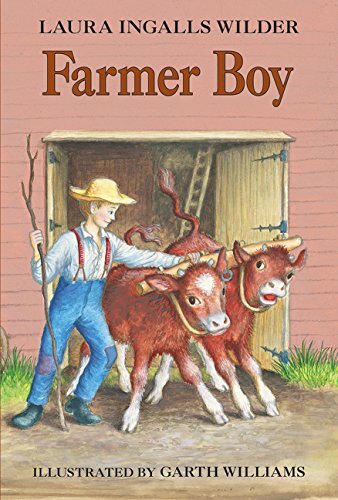 When reading Farmer Boy to your kids ... don't read it on an empty stomach. Almost every chapter Wilder's descriptions of the food preparation will leave your stomach rumbling and your mouth watering. But then instead of growing our food organically and preparing it at home like they did back then, you'll be left with the temptation to go out and grab some fast food through the drive-thru.